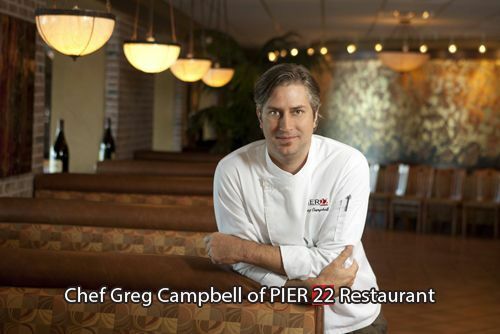 Bradenton, Florida, May 24, 2013 – Chef Greg Campbell, of PIER 22 Restaurant, has been honored as one of the country’s top culinary talents in the inaugural edition of Best Chefs America. This is the first-ever peer review guide of U.S. chefs, who were chosen after extensive interviews between their fellow chefs and Best Chefs America analysts. Chef Greg is the Executive Chef and General Manager of PIER 22 Restaurant, located in Downtown Bradenton on the Manatee River at 1200 1st Avenue West. PIER 22 is a casual fine dining restaurant with inside and outside waterfront seating. Located on a pier that dates back to 1878. In addition to magnificent water views, historic ambiance and impeccable service, what makes PIER 22 so popular with guests from near and far is a commitment to using only the highest quality ingredients. Locally sourced produce, fish and meat are a key to offering the best dining experience in this world class restaurant. Reservations can be made by calling 941-748-8087.